High level performance and style. This is Cessna's entry-level jet that simply redefined the performance standard of the very light jet segment. The model boasts impressive range and maximum cruising speed, and can climb even faster than its predecessor (CJ1). For good reason, it is one of the top sellers. 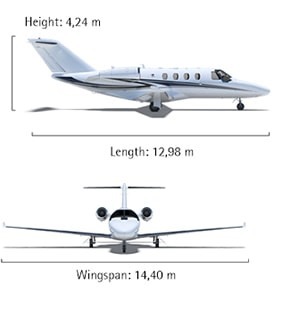 Equipped with two powerful Williams FJ44-1AP-21 engines, the Citation M2 exceeds 740 km/h. The model has features that make piloting much more user friendly. Its cockpit is equipped with Garmin G3000 avionics and three 14-inch LCD screens that alternate between primary and multi-function displays, plus two touch screen panels, allowing you to track maps, flight plans, and weather conditions with ease. The Citation M2’s cabin is spacious, has a private bathroom, and offers passengers and crew the latest ergonomic features. You can’t help but feel comfortable aboard this super-machine. The Citation M2 features an aluminum frame, straight wings, a T-tail, and a distinctively designed cabin. Its large cabin has generous proportions, can carry up to seven passengers, and has spacious seats with adjustable height. 5 MLW, SL, ISA, per Part 25.